In the comments for my Goodie Box Giveaway, several people have expressed interest in hearing about the area I live in. 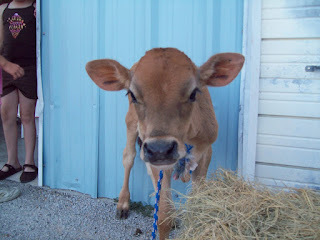 Podunk is located in the middle of a bunch of dairies. Today the area dairy producers had an appreciation breakfast for Podunk County, thanking the people for supporting the local dairy industry. I am pretty sure the whole town showed up for this yummy free meal! 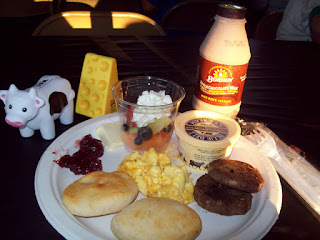 They served biscuits, butter, cheesy scrambled eggs, sausage, jelly, fruit & whipped cream, milk, and even ice cream! It was so good and we all had a really great time. 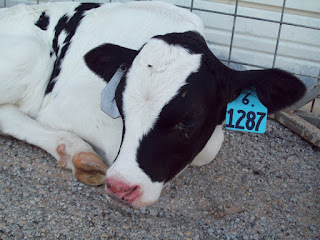 There were even two adorable calves out front for the kiddos to pet.